In two previous posts (Grace 1 and Grace 2) I have tried to emphasize that grace is absolutely free. The objection that is always raised when I write about grace this way is this: Won’t people take advantage of this kind of grace? But grace that comes with restrictions to avoid being abused is no longer grace. Inevitably, whenever I speak or write about grace this way, someone objects that I am contradicting Paul who said in Romans 6:1 that we should not continue in sin so that grace may abound. Whenever someone asks this question, I am always pleased, because it shows that they are finally beginning to understand grace. In Romans 4–5, Paul has been writing about the radical, scandalous, outrageous grace that I have been presenting here as well. 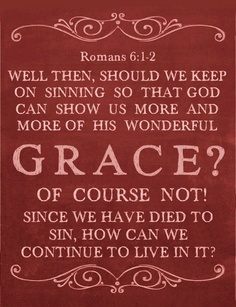 Note that Romans 6:1 is an objection to Paul’s teaching about grace. 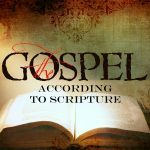 It is only because of what Paul has written that someone raises the objection that if what Paul is saying is true, why can’t people sin all they want? Paul goes on to explain why people should not, but he never says they cannot. 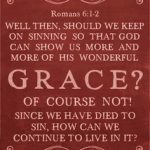 And nowhere does Paul say that if people continue to live in sin, they will come to the end of God’s grace, or will prove that they were never truly justified in the first place. No, Paul argues that if a person truly understands the love and grace of God, and what God has done for them in Jesus Christ, this knowledge will lead them to live free from sin, not to live in sin even more. This is why I like to say that Romans 6:1 is actually the litmus test for anybody’s teaching on grace. If someone is teaching about the grace of God, and after they are done, nobody raises the objection that is raised in Romans 6:1, then the teaching on grace was not truly teaching grace. If you are teaching or writing about grace and you get this question, rejoice, for you have helped someone see the shocking, scandalous, and outrageous nature of God’s grace. If you’re not taking flak, you’re not over the target. Why the double post, btw? Exactly true. You don’t know how many times I have met the accusation “why not live like the devil”. The upcoming book, “19 Questions About Grace” by Bold Grace answers this question. Fantastic. Looking forward to it! Paul raises the question ‘Shall we sin that grace may abound’ and then answers this with ‘Certainly not’. Thus we conclude that Paul teaches that people cannot sin all they want. Therefore a person reading Paul would not conclude that Paul was not antinomian and by the judgement of some his gospel is therefore faulty. Most grace preachers would only be accused of antinomianism briefly. Once they start discussing their views on discipleship/discipline/sowing & reaping, it becomes clear they aren’t antinomian. Exactly right. I have never met an “antinomian” grace teacher, especially when their views on discipleship are factored in. Wow, that is good! Thanks, Aaron! One of the reasons we do not continue to sin is so we do not lose our rewards at the Bema. Wow! I love that quote! It isn’t ideas and principles that sanctify us but the power of the Holy Spirit. If we are the Messiah’s and have been justified by faith then we will be sanctified by the power of God working in us. Now if there is no change at all in us this might be evidence that we are not the Messiah’s. Exhortation to holiness (based on principles) plays a role since the Holy Spirit can take this and use it for our correction. But exhortation does tend to morph from an encouragement to holiness to a legalistic demand for holiness. We are God’s people not the pastor’s or priest’s. I offer a different view, if you would like to consider it. ideas and principles can indeed sanctify us, just as they can defile us, depending on their nature. The most holy ideas and principles come to us through the act of seeking God — isn’t it so? And this is how God works in us — by helping us to recognize the gap between His will (ideas and principles) and ours and by inspiring us to follow. We may experience that desire as coming from ourselves, which delights God and us, or we may become aware of resistance within ourself, which signals our need for spiritual growth — either way, we are just junior partners, agreeing with our will, while God leads in infinite wisdom. You see, where is legalism, where is confusion? We turn to God, He inspires and leads, and we follow, easily or with difficulty, but consenting we follow. I am forwarding the whole series of posts on this matter so far to a friend who is a farmer and pastor of a small congregation in a small rural farming town of South Africa. He has been preaching Grace for some time now and even has resistance from his own brother who is also a pastor. I am sure he will enjoy this. I agree completely !! I enjoy every post, email, book and podcast. Always a refreshing new look at the scripture. For me the understanding of grace is not an easy issue because of my many years being taught the moral/legal covenant interpretation of the gospel. I now look at the so-called parable of the prodigal son and I realize it is not the a parable of the prodigal son , not even the parable of the loving father. It is the parable of outrageous scandalous grace. Jeremy has shown me over the past couple of years how to challenge my existing belief system arising from (as Neville describes as) “moral/legal covenant interpretation of the gospel”. I always had a strong sense that what I believed didn’t match what Christ taught. Trying to seek answers to that confusion always met with resistance from the institutional church. Now by seeing scripture through the lens of Christ.. for me, makes all the difference. Gods Grace is so complete, so covering and powerful that it seems to me He is less interested in our failings and more interested in our vocation which He has given to us. ie Knowing this sets us free so realize we are made in His image (a God of Love not anger) and we are to reflect that to others, announcing and demonstrating that His Kingdom is here, through providing grace, mercy, justice and compassion to a dark world, at the edge of life and at the gates of peoples personal hells. This is a refreshing way to look at scripture. Paul’s teachings on Grace are some of my favorites. He says Grace abounds for us but then you should ask why it is so that some Christians do not walk their daily lives in the grace given to them?